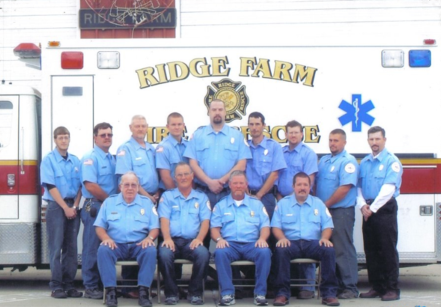 The Ridge Farm Fire Department is a volunteer unit. It functions as a separate entity apart from the Village of Ridge Farm. The Village of Ridge Farm is proud to have dedicated individuals willing to sacrifice for the good of their neighbors. The Village of Ridge Farm thanks each and every individual who serves and have served as our volunteer firefighters. Funding for the Fire Department is driven by donations and fund raising events held each year. These event not only help raise necessary funds for the protection of Ridge Farm residents, it is a great way to visit with friends and the dedicated, volunteer firefighters. Fund raising events include Country Rhodes BBQ and Fish Fry, both held at Ward Park. Ghost Rally begins at the fire station, the Fireman's Pancake and Sausage Breakfast and Ham/Bean Dinner is also at the fire station. Help Support Your Village of Ridge Farm Fire Department! Donate Today!